I don’t know about you, but I’m feeling a little overwhelmed by the constant need to check in with my Facebook friends and Twitter tweeps. I love the way that we all now live so interconnected and it’s so easy to check up on someone – a quick visit to their Facebook can tell you what’s up, or looking at their Instagram feed or event their latest Foursquare checkin – but the need to be online is getting to be a bit much. I work for myself these days, but back when I worked in corporate it wasn’t much different – the need to be accessible even on holiday is incessant. This used to be a distinctively American phenomenon, but I see people from all over the world complaining about this problem. 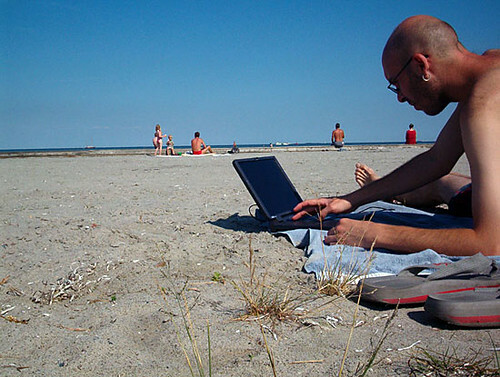 Here’s some personal tips – gleaned from experience – for helping you get unplugged while on holiday. 1. Make it clear you will not be accessible. Inform whomever needs to be informed well in advance (2 weeks is good, more time if your trip will be longer than a week) that you will not be accessible. Explain what are the alternative arrangements, and what qualifies as a good reason to contact you. Emergencies happen, but everyone’s definition of an emergency is different. 2. Designate a proxy who can make decisions on your behalf. This is probably my biggest life-saver ever. Designate ONE person who is proxy. This is great for those of you entrepreneurs, but corporate folk can also benefit from a person who is your eyes and ears on the ground. Give this person access to your email inbox and alert them to anything they should watch out for and let you know. Then tell them how you’d like them to get hold of you – maybe they’ll email your private email address with an update, or text message you in the event of X, Y, or Z. Make it clear when you want to hear from them. You might want to tell people who your proxy is. Or, you might just have some delegates and your proxy is just a silent observer. It depends on your personal work situation. 3. Set your own parameters for when you will check in, if at all. I understand you may want to check in online so family and friends know you’re ok, or perhaps you are just not in a position to remain incommunicado with work. That’s ok, but make it clear that you’re only checking in at 8AM in the mornings for 1 hour and the rest of your day is with your family. Tell your travelling partner about these parameters, so that 1) they can respect them, and 2) they can help enforce them! 4. Try to stay away from your gadgets even on relaxing activities. One of my favourite things to do on my iPad is flip through my magazines via Flipboard or Zite. Unfortunately what comes with that is a temptation to Tweet and Facebook items, and then all of a sudden I’ve spent 10 minutes responding to emails. What kinds of things do you need to do in an emergency? If it’s just emails, then your smartphone will probably do, or maybe you need a tablet if you have one. Even a kindle has a relatively crude browsing function that will suffice for some things. But skip the laptop if you can. It’s heavy, you have to take it out at airport security, and let’s face it – they’re terrible to type on at the beach, with the sun making it hard to read and sand getting in the keys. When you unplug on your holiday, you will truly return refreshed and more relaxed, and more productive than if you’re checking in all the time. Stand your ground, respect your needs for time off and hopefully everyone else will respect them too!